I love three-bean salad — the kind we used to make in the Midwest as a picnic staple. Thing is, your typical three-bean salad recipe calls for about 3/4-cup of sugar — crazy! So I’ve been playing around with bean salads trying to get that same sweet/sour taste without the refined sugar. I think this one is pretty darn good. The sweetness comes from fresh corn, not sugar. Sunflower seeds add nuttiness and crunch. De-stem the green and wax beans and snap each in half. Steam for three minutes on the stove-top or in the microwave. Shock with cold water and dump in a big bowl. 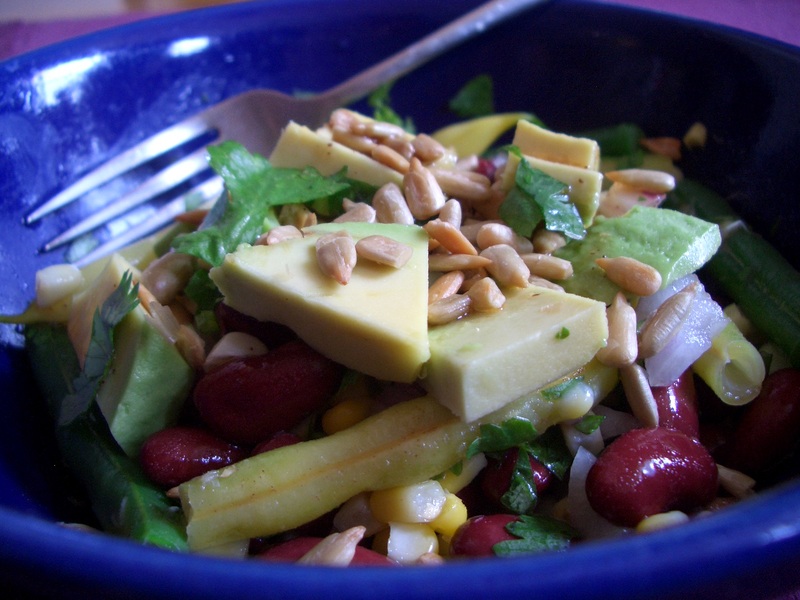 Add the corn (no need to cook it), red onion, kidney beans and chopped cilantro. In a small covered bowl or jar, combine dressing ingredients. Shake until emulsified. Pour half of the dressing over the salad and taste; add more if you like. Save extra for another salad. This is one of those salads that tastes even better if you refrigerate it for a couple of hours, but it’s not required. Just before serving, sprinkle with 1/2 cup shelled sunflower seeds (more if you want) and the chopped avocado.